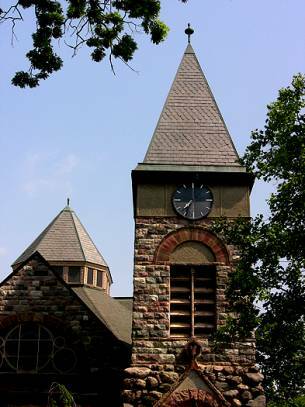 The Olivet Congregational Church tower. 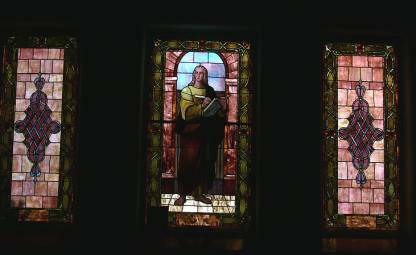 This 1834 edifice is home to one of Walter Holtkamp’s most innovative pipe organs. 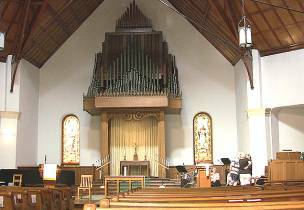 The Holtkamp “tower of power” as seen from the rear of the sanctuary. Note the drapery behind the altar. A peek behind the drape reveals even more pipe work. Dana Hull takes a turn at the Holtkamp console. 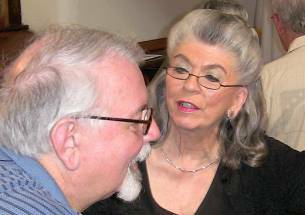 A tête-à-tête between Brooks Grantier and MaryAnn Balduf. 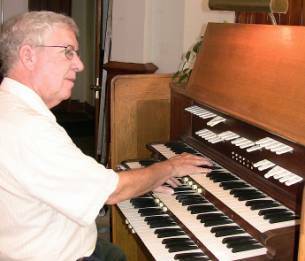 Ed Price at the three-manual console. 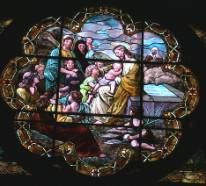 Ken Holden holds forth in a discussion about the 1942 Holtkamp Opus 1613. 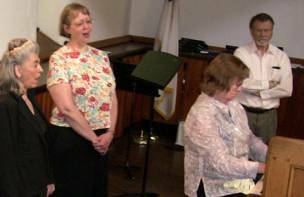 Ellen Tipton plays as MaryAnn Balduf, Carolyn Hiestand and Andrew Leat sing along. 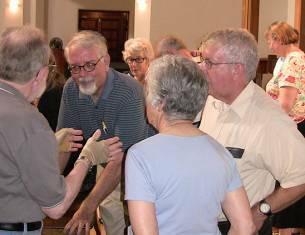 The June meeting of the Michigan Chapter convened on June 4, 2011 at 10 a.m in the sanctuary of the First Congregational Church, Olivet, Michigan. Hosts for the meeting were OHS member Brooks Grantier and Rev. Henry “Jack” Brown, Pastor of Olivet Congregational Church. Chapter members attending were Carl Balduf, MaryAnn Balduf, Ken Holden, Dana Hull, Ed Price and Jim Wilkes. 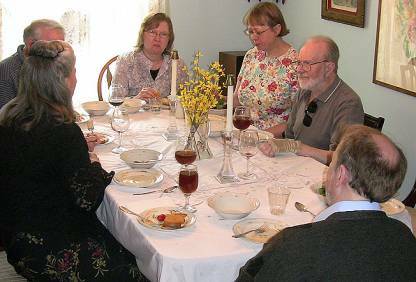 Guests included Carolyn Hiestand, Andrew Leat, Linda Jo Scott, Ellen Tipton and Mark Wells. 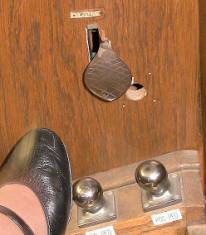 Minutes of the May 21 meeting were not available but Treasurer Terry Jankowski reported a balance of $1,796.91. The report is available below. There being no further business, the meeting was adjourned at 10:15 a.m. 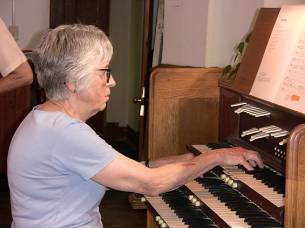 Following an introduction to the Walter Holtkamp Opus 1613 pipe organ, the attendees investigated the construction and tonality of the instrument. 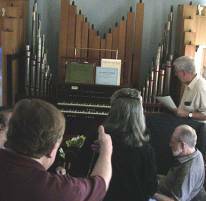 Shortly after noon, most of the group traveled to the Lansing home of Ben Baldus, there to partake of lunch and to explore a Hausorgel by Brian Fowler, harpsichord by Baldus and Wiggert and an exceptional Steinway piano. 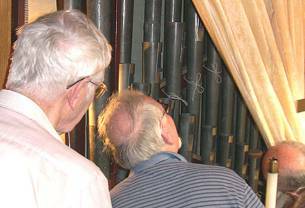 Click here to repeat the organ audio on this page. The group prepares for the traditional OHS meeting “Sing-along. CLICK HERE TO WATCH. 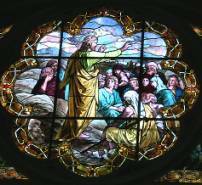 A few of the many beautiful windows to be seen at the Olivet Congregational Church. 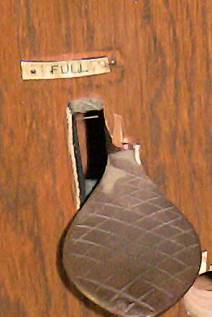 The hitch-down sforzando pedal on the Holtkamp pedal board. Ben Baldus introduces the group to his Hausorgel. 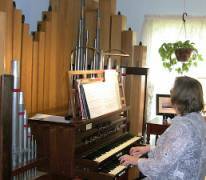 Ellen Tipton at the Hausorgel. 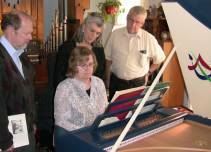 Ellen Tipton tries out the harpsichord as Mark Wells, MaryAnn Balduf and Ed Price listen to the dulcet tones. Ben Baldus tickles the Steinway ivories as Dana Hull, Ken Holden and Ed Price listen.